This past weekend my darling daughter turned twelve (I’m till not sure how she grew so fast), and to celebrate, we had a beach bonfire birthday complete with dinner, s’mores, and tasty cupcakes. I wanted the cupcakes to be extra special for her birthday, so I came up with some fun cupcake toppers made from tissue paper that I just love! 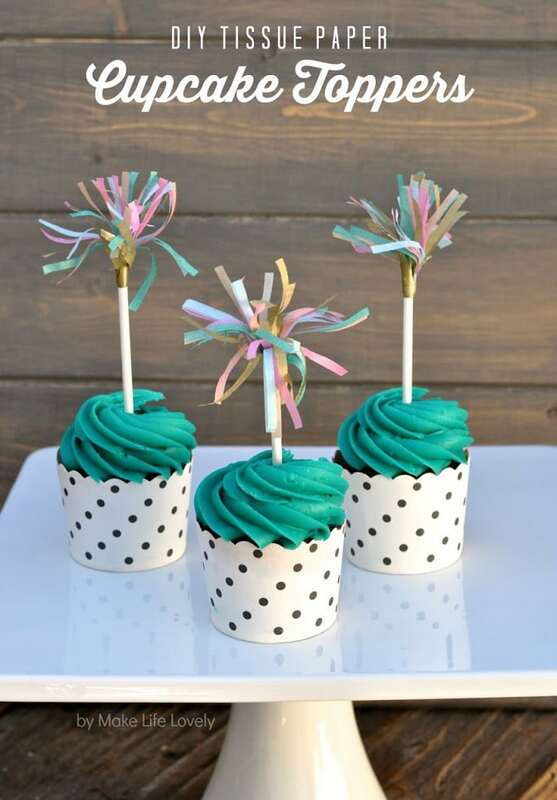 The idea for these came after I finished a chalkboard and tissue paper tassel garland for the party, and realized that I had tons of tissue paper left over, and a lot of colorful cupcakes that needed a little something more on top. I just love the way these little beauties look they are exploding at the top of each cupcake… almost like a candle, or better yet, fireworks, on top of each one! They are fun and quick to make, but are impressive to all your cupcake eaters. 1. Stack the tissue paper all in a nice neat pile, and cut a rectangle out that measures about 3.5″ high and as long as you can make it. Fold the rectangle in half horizontally. 2. Place the folded side up. Using the fringe scissors (which I believe are one of THE coolest inventions ever created), cut starting from the side opposite the folded edge, up to about an inch away from the fold. Use your scissors to cut that little section of fringed tissue paper off. 3. Apply a thin line of hot glue to the folded end of the tissue paper. Place sucker stick or toothpick carefully onto the hot glue, and press down while twirling the stick in your fingers so that the tissue paper is wrapped all the way around the stick or toothpick. Be careful because that glue is hot. 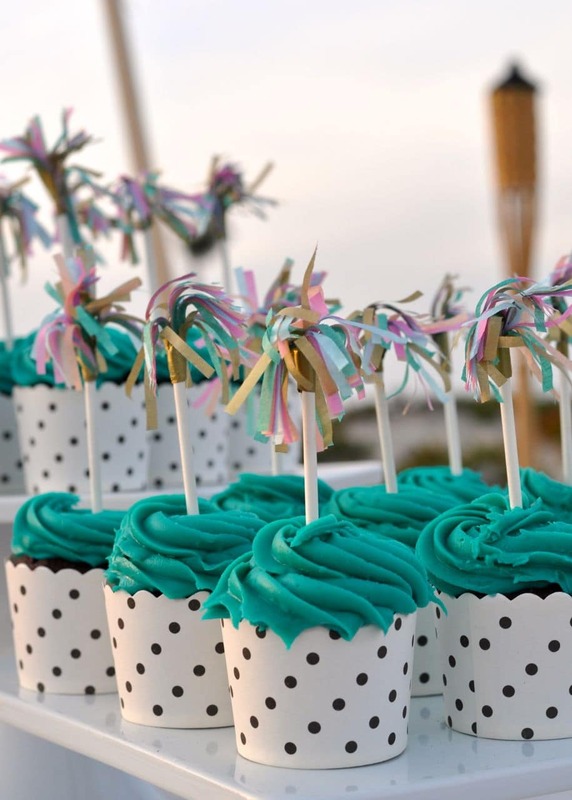 Twirl the stick from the bottom to fluff out the tissue paper fringes, and be proud of your cute little cupcake toppers! These are so easy to customize in any party or team colors, and are just too darn cute not to make. I put the cupcakes inside these cute paper cupcake wrappers from Wholeport. Here they are on the beach this past weekend at the party… you might recognize this photo if you follow me on Instagram. If you don’t already, I’d love for you to follow along!